What does it mean to "practice" Asian American Studies? Four W&M students attended the annual conference of the Association of Asian American Studies to help address that question, contributing their own panel discussion to the bounty of workshops, films, exhibits, and plenary sessions on offer. Professor Ferrão (English, Asian & Pacific Islander American Studies) also attended. The conference was held March 2018 in San Francisco. The annual conference attracts Asian Americanists from all disciplines and different regions of the country. Current scholarly research and developments within the field are highlighted, and attendees meet informally to share their perspectives and insights. In a joint letter of appreciation for support from the Arts & Sciences Annual Fund, the W&M students noted, "Our time spent at this conference with Professor Ferrão allowed us to place our academic learning into perspective. . . . Staying near the historic San Francisco Chinatown — an important APIA community site — we delved into an area where constructions of race and nation first developed and continue to develop." 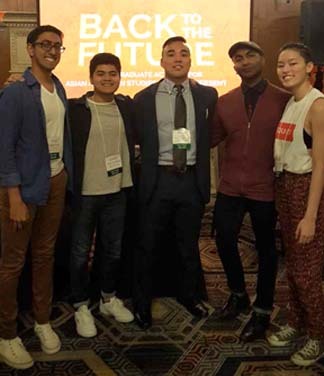 The Smithsonian Asian Pacific American Center invited the students to the conference and hosted their panel discussion, "Back to the Future: Undergraduate Activism for Asian American Studies." According to Professor Sohoni, interim director of the APIA Studies Program, "Our students were able to hear and meet top academics in the field of Asian American studies, as well as learn how to present their own work in a professional academic setting. They have benefited immensely from participating."